Bijan is a highly awarded fine-dining restaurant in Kuala Lumpur. I've seen the name so many times but never read the reviews and I've always had the impression that it was a French restaurant. I walked into the dimly-lit Bali-style restaurant with its al fresco dining area, bamboo blinds and palm trees and expected a fancy French menu but while the prices were French enough (i.e. affordable only on special occasions), the cuisine was Malay with a hint of Indonesian. There are no fine-dining Malay restaurants in KK, a fact that I've always complained about. We don't even have a decent Malay dining restaurant to bring our visitors, other than standard hotel restaurants that have a few Malay dishes on the menu as an afterthought. I smell financial opportunities in that vacumn but I think unless we get some entreprenuer from KL, local Malay restaurant cuisine will continue to be limited to soto daging and nasi lemak. Bijan (not the French name but sesame seeds in Malay--but of course! ), I'm told, has slipped a little in its standards recently although it is still rated among the top Malay fine-dining restaurants in KL. 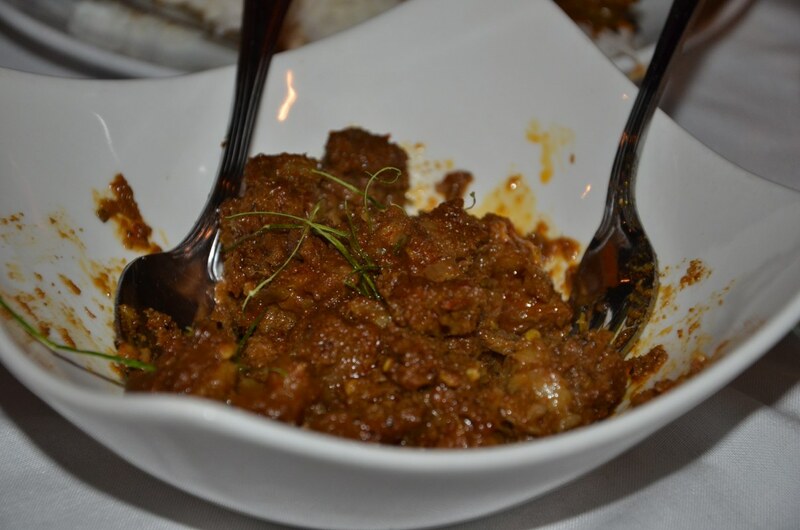 Despite that, I loved the food at Bijan, and my top pick is Opor Rusuk, succulent and aromatic beef ribs stewed with spices and coconut milk. 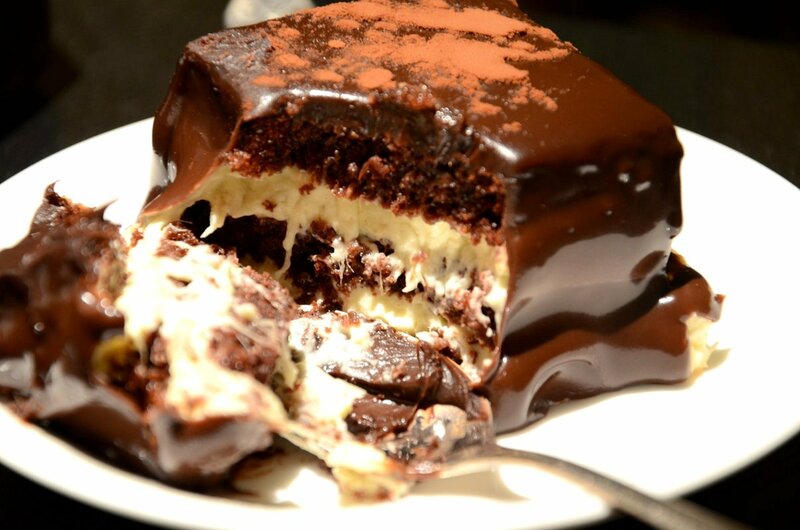 Another unforgettable item is Bijan's Chocolate Durian Cake, which was a slice of heaven, trite as it sounds. 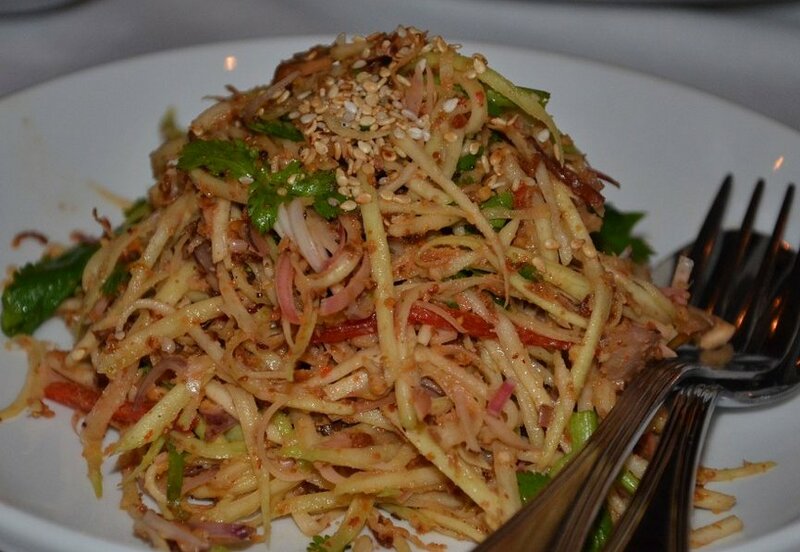 Kerabu Mangga, a tangy-spicy salad of unripe mangoes that went well with the rich dishes. 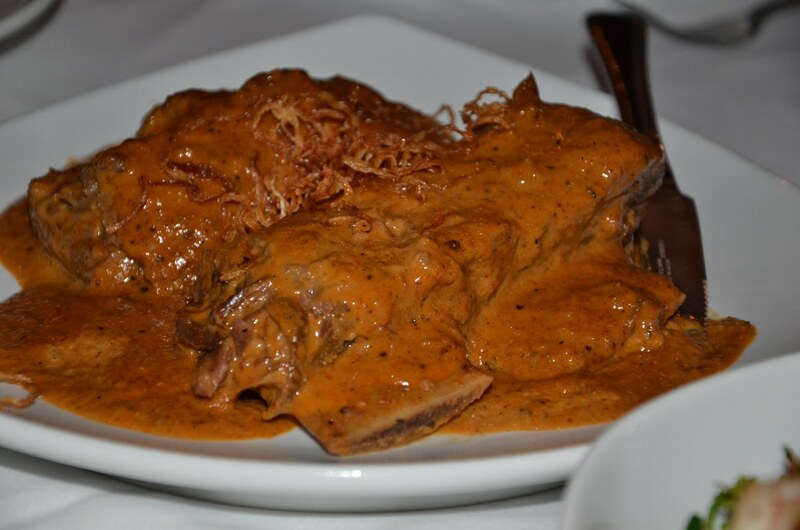 Opor Rusuk, stewed beef ribs in spices, toasted coconut, gula melaka and coconut milk. So, so good--the best dish. Superbly-flavored ribs slow-cooked until it was super tender yet still stuck to the bones. Terung Goreng Bercili, fried brinjals with a chili sauce. 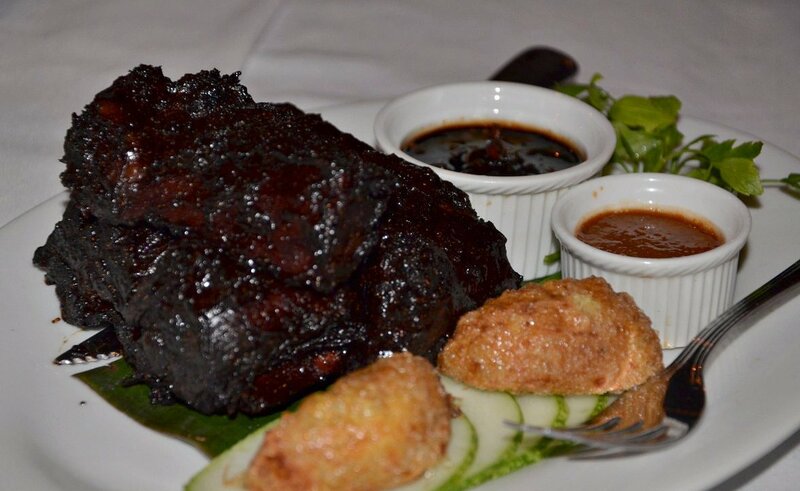 Another delicious meat dish: Rusuk Panggang, bbqed beef ribs with dark soy sauce, belacan (shrimp paste) and spices. 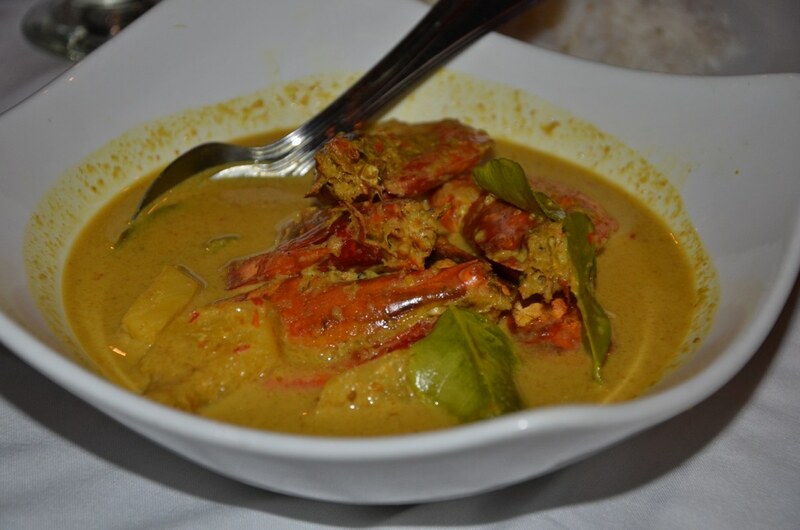 Masak Lemak Udang Dengan Nenas, prawns and pineapple in a spicy coconut sauce. I have no recollection of this dish! Or this chicken dish, partly because it was so dark in the restaurant (next time I come to Bijan, it'll be before sundown because I want to be able to SEE the food and place) and everything was just so yum. Dang, I don't know this one either but like all spicy dishes, this was heaven when eaten with white rice. 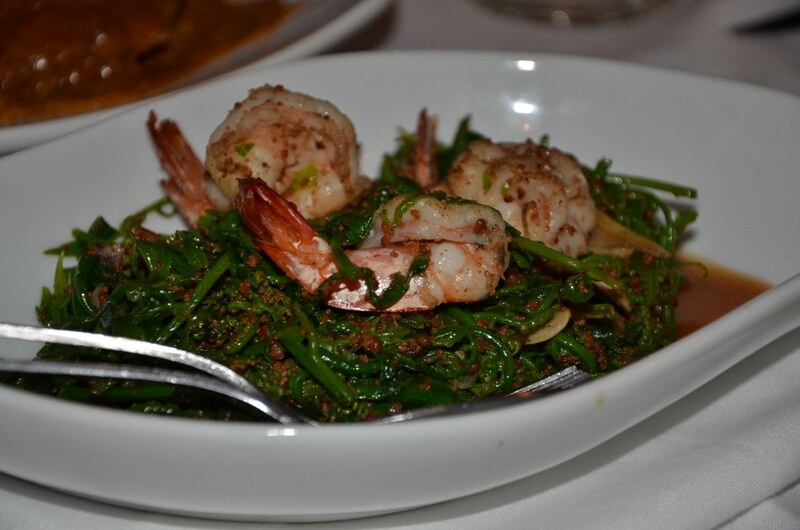 Pucuk Paku Goreng Tahi Minyak--what is 'tahi minyak'?--, stir-fried wild ferns and prawns with chili and caramelized coconut. Are you drooling yet? After all that, I thought I should skip dessert but was told that it would be a big mistake. 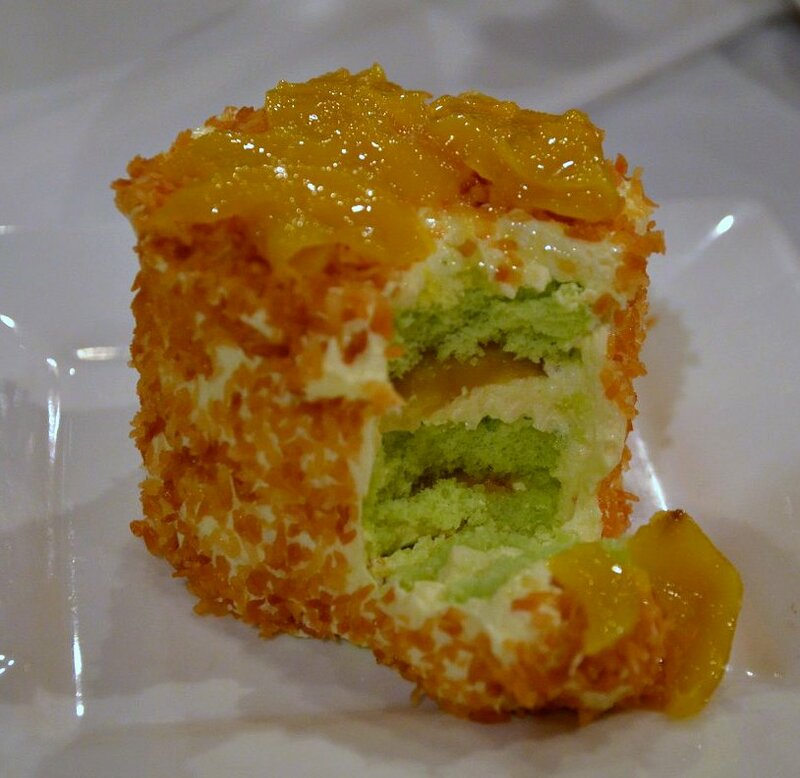 I took a small bite of Sharmaine's Beach Holiday Cake, a soft pandan sponge covered with buttercream, mango compote and toasted coconut. It was yum but didn't blow me off my feet. 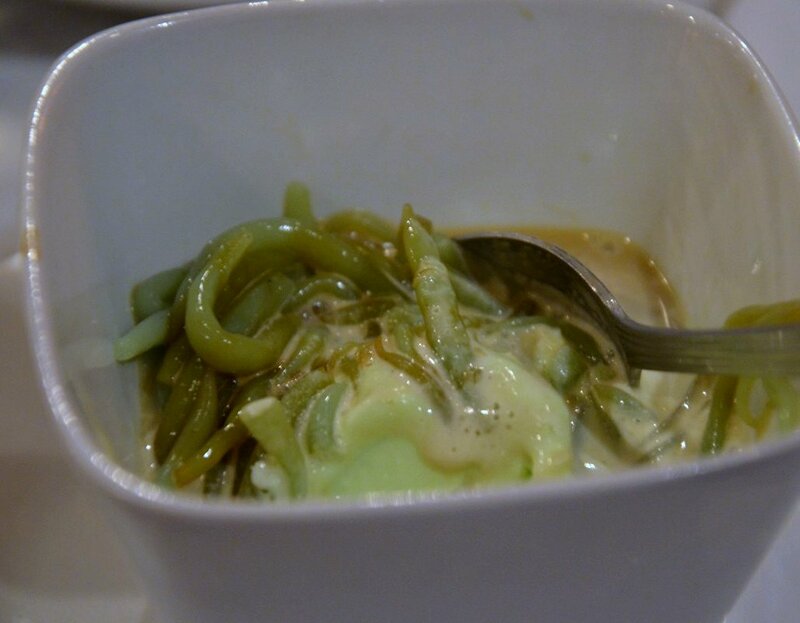 Classic cendol, pandan-flavored mung bean strips with gula melaka (palm sugar, the best-tasting sugar in the world, I must repeat) and coconut milk. Forget about fussy multi layered Opera cake and other fancy stuff. Cendol with good coconut milk and gula melaka is simple but ohhh-sooo-goood. Finally, the crowning glory of Bijan's dessert menu, the Chocolate Durian Cake. What can I say? This blew me off my feet. Many thanks to the Royal Selangor folks for the superb meal which was made doubly enjoyable by their company! Open Mondays to Sundays 4:30pm to 11 pm. 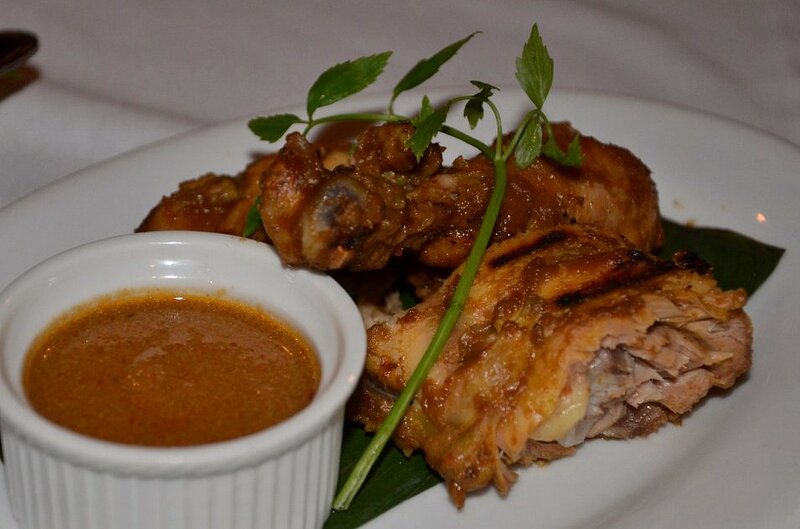 Give Spice Island at the Marina, Sutera Harbour a try! 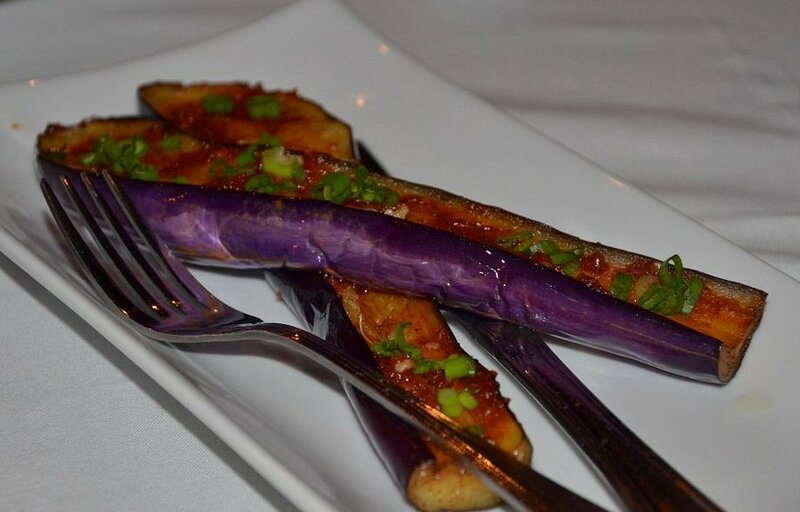 It's a Malay - Indian fusion. Check it out, they may open to non members as well. are most of the items here beef? or is there fish/ chicken? In Klang Valley, Rebung, Ibunda and Khatijah Ibrahim restaurant served good Malay food. In Ibunda, the food plating and atmosphere is finer than Rebung and KI. You feel more at 'home' in KI and Rebung, very Malay kampung food but good. Bijan has been on my list of "to visits" for some time now. I hear it's just about the only Malay food place in town where you can get wine with your dinner. Hmm..ive never heard of bijan or the other malay restaurants mentioned by Anon. btw tahi minyak is the crusty bits left behind after clarifying coconut milk for a long time until the oil seperates and you can see the 'tahi minyak' in teh oil....much like clarifying butter until it turns golden brown and solids begin to brown. It's always so nice watching your pictures!! They make me so hungry!! Unfortunately I didn't get the job :-(, but I am strong and positive and I am sure everything will be fine!! I've got to try this restaurant if I ever get the chance to stop over in KL. None of the Malay food here blew my socks off. They were rather bleh. Hi Terri, Gong Xi Fa Cai to you and your family! I stumbled upon your blog and I love it. You are so honest and funny with your opinions that I felt I experienced the food and places with you. I especially love your entries on Hong Kong as I just moved here with my husband for his job. Just to let u know Ibunda is closed already. And Bijan isnt the only Malay restaurant in KL that you can have wine. Try Songket Restaurant - a new Malay restaurant tucked away in a cosy corner of Jln Yap Kwan Seng. They have durian tiramisu that is to die for :) www.songketrestaurant.com. Came across your blog by chance. You wanted to know what is Tahi minyak? Just paku. Should be able to find them easily in Borneo. I used to teach in Kuching, Sarawak, they are everywhere and I used to pick them. Good to make stir fry and karabu. michelle: hi, welcome! keep in touch! kelly: hi, welcome n stay on touch! anon: sogket restaurant...i must rmber it. thanx! pg: zurin in a comment above said tt tahi minyak is the fried bits of coconut. i'd go with her bc the dish can't be "paku fried with paku". I think you giving great advice for playwrights staring out.Very nicely described your thoughts here.I like to read more about this. Wow! Can't wait to visit Bijan! How are the prices? This means that you literally burn fat by consuming Coconut Fat (also coconut milk, coconut cream and coconut oil). These 3 studies from big medical magazines are sure to turn the conventional nutrition world around!